Which Balearic Islands should you choose for your vacation? The Balearic Islands of Spain are made up of four main islands: Mallorca, Menorca, Ibiza, and Formentera. They also include Cabrera and several other islets. This Mediterranean archipelago is a highly valued tourist destination and the capital, Mallorca, has recently been recognized as one of the best places in the world to live in by the British journal The Sunday Times. If you’ve chosen these islands as your vacation destination, you may be wondering which one is the best one for you to visit. That will all depend on what you’re looking for during your Mediterranean getaway. The city’s ranking as “the best place in the world to live in” has attracted many tourists from around the world to see for themselves what makes it so special. In essence it’s an enormous island that encompasses all the comforts of a city with the appeal of an exotic island, which is what most attracts attention. It’s important to keep in mind however that Mallorca gets crowded throughout nearly the entire summer season. This makes it an ideal place for vacationers looking for a destination with many extensive beaches and many other visitors like themselves. This is reflected in the price of the accommodation, which is sensibly more economic than the rest of the islands. The entertainment options here are quite varied as they are on Ibiza. Ibiza has been considered an island paradise since the mid 20th century, where alternative social and musical trends have originated and expanded across the small surface area which is characterized by scenic white-sand coves. The period between the end of the 20th century and the beginning of the 21st saw the height of Ibiza’s youth tourism, which concentrated on partying that lasted all night and all day. Despite the current legal restrictions on the opening of night clubs, and although the island also offers scenic coves and natural landscapes, it continues to be a destination recommended for those looking for a place to party. The island of Menorca is a nature paradise with many large coves where tourists can go snorkeling and diving among all types of fish and mollusks. The protection given to natural areas makes this a lush and scenic island; many coves can only be accessed after a long walk. 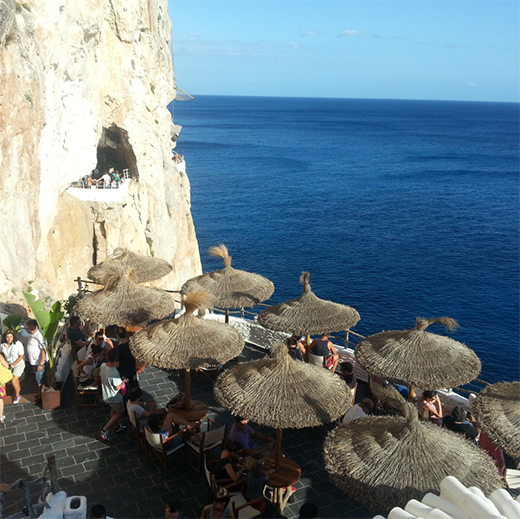 Nightlife is not as active here as Ibiza: there’s only one large night club on the island and it’s tucked away in caves overlooking the sea, which gives it a magical ambience. This island is clearly the best destination for nature lovers. Finally, Formentera (like Cabrera) stands out as an ideal destination for a different type of vacation. It’s extremely small, the entire island is protected from external contamination and only naturalists and lovers of the most primitive islands find the vacation of their dreams here. If you’re one of them, this is the destination for you. Posted May 8, 2015 by amerispan amerispan & filed under Travel News & Info, Uncategorized. A Kasbah is a type of Islamic city or fortress, which in past times was used as a defense against an attack, and as a home for the leader of the city. It was often built on a hill as a better means of defense, which is true of the Alhambra in Granada, considered the best Kasbah in Spain. The Alhambra was first built in 889 as a fortress, and later converted into a royal palace by Yusuf I, the Sultan of Granada, in 1333. The Alhambra was the stronghold of the Muslim rulers in Spain until 1492. It had survived many attacks before it was finally surrendered to the Catholic Monarchs, Isabel and Ferdinand, after the War of Granada, marking the end of the Spanish Reconquista. The Monarchs began to change the Alhambra, as did the Christian leaders after them. That said, the Moorish architecture is evident everywhere you go and it remains to this day, very well preserved. It is in fact the best preserved medieval Islamic palace in Europe, and a UNESCO World Heritage Site. - The Royal Palace of the Alhambra is divided into three parts; the first, the Mexuar, is fairly modest in decoration compared to other parts of the palace and was primarily used for business administration at the time. The Serallo is a collection of very beautiful rooms and courtyards; the most notable being that of Patio de los Arrayanes, Courtyard of the Myrtles. The Harem makes up the final part, and consists of the living quarters and bath for the wives and mistresses. It also contains the Hall of the Abencerrajes, with the most beautiful ceiling in the whole of the Alhambra. This room is famous, as legend has it that King Boabdil, the last Muslim emir, killed the whole of the Abencerrajes family here after inviting them for a banquet, as he found out that his favorite mistress was having an affair with the head of the family. - The Alcazaba is the ancient fortress of the Alhambra Palace; parts of which are in ruins, but it is still very much an important part of its history. - The Generalife is the Alhambra’s answer to a retreat; a place where the Muslim Kings could be surrounded by beautiful gardens, flowers and fountains. This really is a magical place and is most definitely worth the visit when going to the Alhambra. With these different parts of the complex to offer; all so beautiful, and all so well-preserved, it’s no wonder that the Alhambra is the best Kasbah in Spain! Posted June 26, 2014 by AmeriSpan Staff & filed under Travel News & Info, Uncategorized. South Korea is the fastest growing economy in northern Asia and is ranked thirteenth in the world with a GDP of $1.64 trillion. Some of the world´s biggest brands are based in Korea, like Hyundai, Samsung and LG. This translates to excellent opportunities for native English speakers with knowledge of the Korean language. As the economy continues to grow, so too will the demand for these foreign workers! Knowing such an unusual language will make you more employable. Most native English speakers can´t even speak any foreign language, so stand out from the crowd by being one of few who knows Korean. Even if you´re not applying for a job that requires Korean language skills, it still shows your ability to learn new things or could even just be a talking point at an interview! Contrary to popular belief, Korean is actually the easiest of the Asian languages. Unlike Chinese it is not tonal, and the language is based on an alphabetic system, so all you have to do is learn a new alphabet of eleven characters – simple! Once you have mastered Korean, you´ll be able to learn other Asian languages far more easily than before, since many of them share common vocabulary and grammatical structures. In many ways, Korean is actually simpler than European languages. What most westerners find tricky is the new alphabet system, but after that there are no verb endings to be changed or any difficulties with masculine and feminine nouns! Knowing Korean gives access to one of the oldest civilizations in the world a whole new culture, such as the intricacies of Korea´s system of respect or its famous World Heritage Site shrines, dotted around the country. You could also learn about Korea´s most famous sport: Taekwondo. See for yourself a greatly diverse nation. According to a 2010 census, some 31.6% of the population is Christian, whilst 24.2% is Buddhist – a little known fact! Korea´s capital – Seoul – is the largest city proper in the developed world, accommodating about half of the South Korean population. A survey by the United Nations placed Seoul´s quality of life higher than London, New York or Melbourne. Finally, research suggests that studying a language reduces the risk of Alzheimer’s. What´s more, the more challenging that language is, the more the risk is reduced. So with the disease being the sixth largest killer in the US in 2012, what better way to stop it than by learning Korean! Posted May 12, 2014 by AmeriSpan Staff & filed under Uncategorized. Hear the word ‘Greece’ and what comes to mind? Is it crystal clear seas? Is it the birthplace of democracy and civilization? Maybe it’s a traditional plate smashing ceremony, or is it Meryl Streep singing Dancing Queen on a boat jetty?! Whatever your initial reactions, ‘Greece’ has different meanings for many people. Having been on holiday to Greece many times, I can vouch for its stunning coastlines, welcoming population and amazing climate. But despite some of the world’s most recognizable traditions and practices originating from this country, its language is relatively unknown. Greek may not be the world’s most common language, so unless you have a business in Greece or you plan to spend a lot of time there, there seems little reason to learn it. Yet, the main reason to learn it is to gain a much deeper understanding of one of the world´s most ancient civilizations. The oldest surviving record of Greek dates from the second millennium BC, when large tablets manufactured out of clay were inscribed for religious and administrative usage. As a side note, just to be clear, the difference between Ancient Greek and Modern Greek is huge, and a native speaker of one would not be able to understand the other. Despite this, learning Modern Greek will give you unparalleled access to one of the world’s richest histories. For example, Greece – officially known as the Hellenic Republic – is the birthplace of the Olympic Games, starting in Olympia in 776BC (although some historians place the first event at around 1000BC), primarily for the purpose of getting men fit. It also promulgated one of the earliest forms of democracy, when non-slave adult men were given a direct say in the state’s affairs. The English word ‘democracy’ itself comes from the Greek word for people, ‘demos’, and the word for rule or power, ‘kratos’ – both of which combined to make ‘demokratia’, rule of the people. What´s more, the likes of Plato, Aristotle, Socrates and countless others will all have a much deeper meaning when studied in their mother tongue (albeit its successor). For many people, Greek may not be as difficult as it first appears. Approximately 30% of the entire English vocabulary consists of words that derive from a Classical Greek origin. Words like ‘phone’, ‘biography’ and ‘aero’ all stem from the Greek language, and many of these ancient Greek stems have retained their pronunciation and meaning in its modern day equivalent, making it a whole lot easier for native English speakers. Its influence on other languages around the world means learners are able to recognize and understand words from all sorts of different tongues. The opposite phenomenon has happened as well, with English’s global dominance meaning that new Greek words are constantly cropping up, such as ‘parkaro’ – the verb to park. Also, in a similar format to many European languages, Greek has three genders: not only the normal masculine and feminine, but also a neuter, meaning there are three different ways to say ‘the’. So now you have the information you need to know, go out there and learn some Greek! Posted May 5, 2014 by AmeriSpan Staff & filed under AmeriSpan Blogs. Salamanca is a city located in northwestern Spain, in the autonomous community of Castile and León. It is famous for its university, which is the oldest and most important in Spain, and the fourth oldest in the Western world. The historical center of Salamanca was named a UNESCO World Heritage Site in 1988. Its impressive array of Romanesque, Gothic, Moorish, Renaissance and Baroque architecture gives evidence of the city’s historical past. It was occupied by the Carthaginians in the 3rd century B.C before becoming a Roman settlement. After the fall of the Roman Empire, the area was invaded by the Alans, and later the Visitgoths. As with much of the rest of Spain, Salamanca was taken over the Moors in 712 AD, and remained this way until the 11th Century. The university was granted a royal charter in 1218 by King Alfonso IX, and since then has become one of the most prestigious and popular universities in Europe. Originally, most of the classes were taught in churches and other buildings, until the majority of the university was built in the 15th and 16th centuries. Salamanca is one of the top universities in Spain. As it is such a famous university, as well as attracting Spaniards, Salamanca draws international students from all over the world, as a popular Erasmus destination. It was also the first university to offer Spanish courses, so it now has the most prestigious language courses on offer, which attracts a great number of foreign students. Salamanca has over 30,000 students. This gives the city an international and vibrant feel. It is quite a small city, with a small town feel, so it is easy to get to grips with the city straight away. It is possible to walk pretty much everywhere, which is an enjoyable experience in itself, as the city is extremely pretty with all its cobbled streets and beautiful buildings; there’s always something new to see. The biggest bonus of Salamanca is that it’s cheap, which is ideal for students; not only for accommodation, but for nights out as well! You could spend just 150 euros a month on renting a room in a shared flat! Salamanca is a great night out for students. You can expect to be surrounded by other students, and to have a good time without spending a fortune. It has a lot of bars that you can go to first, to enjoy a few drinks and some tapas; “ir de pinchos” as it’s known here. The best places for this are around Gran Via, or around Plaza Mayor, which would be a bit more expensive. Plaza Mayor is a common meeting place for students, located in the center of the town, with a good atmosphere. Calle Van Dyck in the north of the city also offers tapas bars, with very good prices and good sized pinchos! If you’re looking for a night out clubbing, Salamanca can also give you what you’re after. Going out is possible every night of the week, although the students normally go out Thursday- Saturday. Nightclubs don’t get started until about 1am and can go on well into the early hours, which takes a bit of getting used to! There are many clubs you can choose from depending on the sort of music you’re looking for. The majority of the nightclubs are in the old town, and music can be divided between these zones. You can find live music haunts around the Bordadores disctrict, often with medieval style décor. The area around Gran Via is full of places popular among foreign students with a range of bars and nightclubs of different music styles. More alternative music can be found around Plaza de San Justo. Most places offer some sort of special offer, such as a free second drink, but there are some other places you can look out for it you’re on a tight budget like most students. Liter bars are popular, and you pay a lot less than you would if you were in a club; around €3.50 for a liter of beer! There is also a bar dedicated solely to the one and only Michael Jackson, called “Jacko’s”, which has reasonably cheap prices too! Other popular places among foreign students involve “The Irish Rover” (a nightclub), and the “Chupitería” (a shot bar!). Posted April 1, 2014 by AmeriSpan Staff & filed under AmeriSpan Blogs, Food & Drink, Study Abroad Tips, Travel News & Info. LATIN AMERICA: Mountain, Beach or City? How to choose your Latin American destination? Perhaps a place where you can relax on the warm sand under sunny skies while surrounded by stunning beach scenery, or maybe within chilly Andean mountain landscapes, or how about in a big cosmopolitan city such as Buenos Aires? Here are three general categories you may want to think about to help you choose the perfect school in Latin America: coastal, mountain, and big city. The advantages of choosing a coastal destination are as clear as the sunny blue skies that hang over beach paradises along many Latin American coastlines. Schools in these destinations often offer the luxury of being able to walk to the beach after class, where you can spend the afternoon doing little more than listening to the soft sea breeze and the waves gently breaking on golden sands. Some schools even offer exciting coastal extracurricular activities such as kite surfing and scuba diving. Hot temperatures are not for everyone, so you may prefer a cool weather destination. Consider tossing on a new handmade, traditional, brightly colored wooly sweater that you just picked up from a local open air market high in the Andes. Visit nearby villages huddled between the summits of the vast Andean mountain range, places where the Inca Empire once flourished and continues to influence the region’s rich culture. Mountain destinations are often decidedly less touristic than coastal ones, a factor many students looking forward to immersing themselves in a new language and culture find appealing. Want an exciting study destination where there is always something happening? A big city may be what you are looking for and there are many Spanish schools located right in the heart of all the action where after class you can step outside and explore vibrant urban landscapes. Big cities often offer an exciting and modern variety of restaurants, art galleries, museums and shopping possibilities. Posted January 17, 2014 by AmeriSpan Staff & filed under AmeriSpan Blogs, Travel News & Info, Uncategorized. Advent is a very important part of Christmas in Germany; typical celebrations start on the 6th December with Nikolaustag (St Nicholas’ Day). The night before, children leave their freshly shined boots outside their doors to wake up to them filled with candy and other small gifts. Indeed if they have been “bad”, they will instead be greeted with a boot filled with twigs, provided by St Nicholas’ evil sidekick, Knecht Ruprecht. Other traditions that take place during advent undoubtedly include advent calendars. The tradition of advent calendars in Germany goes back to the 19th Century, where children would draw Christmas themed pictures on the 24 days leading up to Christmas and hang them around the house. The first chocolate-filled advent calendars appeared as early as 1958 and have since been a very important part of Christmas, for children in particular. Another similar tradition is that of the Adventskranz (Advent Wreath), which is widespread in German-speaking Europe. It composes of a decorative wreath where a new candle is lit and placed in the wreath each Sunday on the lead up to Christmas. Christmas markets pop up all over Germany as early as the last week of November, where you can enjoy the lively festive atmosphere, as well as buy all sorts of German Christmas foods, such as Lebkuchen (gingerbread), stollen and marzipan, as well as sample the German’s version of mulled wine, glühwein. 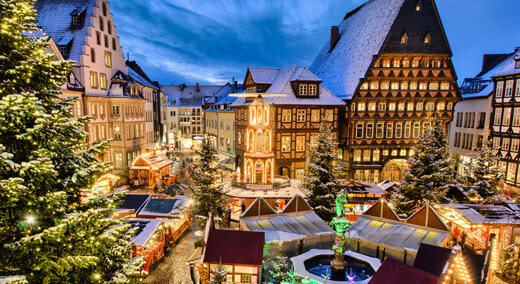 The towns are filled with decorative Christmas lights and trees; trees being an extremely important tradition in Germany as this is where the concept of bring Christmas trees into your home originated, in what we date back as far as the 16th Century. Christmas trees are traditionally decorated by families in Germany on Christmas Eve; some families even prepare a room for Christmas and keep it locked, to then ring a bell and surprise the children with the presents under the decorated tree. Children will leave their Christmas lists out on the windowsill during advent for the Christkind, a blonde “Christ Child” angel with a white robe and wings. Presents are normally opened that evening, as well as a feast of what often consists of karp and kartoffelsalat (potato salad); avoiding meat for religious purposes, the religious people also attend midnight mass. On Christmas Day a typical meal would involve roast goose, potatoes and vegetables, with a selection of sweet German breads flavored with cinnamon, and marzipan for dessert. The celebrations don’t just stop there. After Christmas day, between the 27th December and the 6th January, Sternsingers, or “star singers”, a group of four children dressed up as the three wise men and the star of Bethlehem, visit houses to sing carols and then sign the door of the house when they have finished, which is bad luck to rub off, but it usually fades before the 6th January. The 6th January, epiphany, or Heilige Drei Könige, the Day of the Three Kings, celebrates the arrival of the Three Wise Men in Bethlehem. Families spend the day attending church services, or the children dress up in the Three Kings’ costumes, singing hymns or acting out the Christmas story. Some people gather the night before to toast good health to friends and family and drink bockbier, a beer specifically brewed for this season. Epiphany marks the end of the Christmas season for Germany and Europe. Now you know that Germany has its own unique way of celebrating Christmas, it might be worth a visit to appreciate their traditions for yourself. You can roam the Christmas markets, the decorated streets, and enjoy the food, drink and unique atmosphere that this country which is full of surprises has to offer. Posted August 30, 2013 by AmeriSpan Staff & filed under Study Abroad Tips, Travel News & Info. 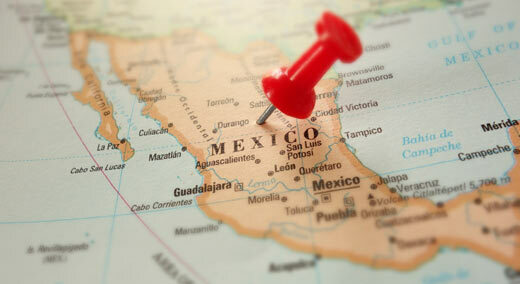 Where is the best place to take a Spanish language course in Mexico? Guanajuato, the childhood home of Diego Rivera, is a charmingly unique colonial city, located in central Mexico. A mid-sized university town brimming with history and art, copious plazas filled with cafés and restaurants and narrow, pedestrianized streets lined with colorful houses – a perfect city for strolling. La Bohemia is a small restaurant in Jardín De La Unión, Guanajuato’s main plaza. It is open seven days a week from eight in the morning till eleven at night. For fifty-five pesos (that’s just over 3 euros) the restaurant offers a meal of the day which includes a bowl of homemade soup, a starter, freshly prepared rice and salad, a round piece of bread known as a bolillo and a refillable glass of agua fresca (a Mexican fruit drink). The restaurant owner has about 50 dishes that he rotates for the meal of the day. It appears that the prices at the restaurant are about the same, if not a bit lower, than other eateries in downtown Guanajuato. Oaxaca is one of the best places in Mexico to enjoy cultural holidays. Around Day of the Dead (on the 1st and 2nd November) families descend upon the local cemeteries to clean the grave stones of their deceased ancestors and have a picnic in their honor. In the city center, street vendor’s spring up selling marigolds and coxcombs (a velvety red flower typical of this season) and market stall owners attract customers with wonderful displays of candy skulls and special bread known as Pan de Muerto. The cuisine in Oaxaca is very rich and varied: from the chocolate-infused meat sauce known as mole to the crunchy fried grasshoppers not for the faint-hearted! As well as a selection of exotic dishes, Oaxaca is also famous for its alcoholic beverages: tequila always took center stage in the past; but over the years, it has risen considerably in price so its “brother drink” mescal has become the tipple of choice for all those who appreciate fine liquor. Mexico City, the fifteenth most populous city in the world, might seem a bit daunting at first, but it doesn’t have to be. The most popular tourist attractions are mainly concentrated in the heart of the historic city center, for example, the main plaza (known as the Zócalo), the Alameda Park and the Palace of Fine Arts. The Plaza Garibaldi, located a few meters away from the Palace is the best place in Mexico City to listen to live Mariachi musicians. The Rosa, Roma and San Angel zones, home to some lovely parks, shops and cafés are considered to be the “artsy” areas in town. The affluent neighborhood of Polanco is the place to be if you’re looking for a good night out. Further south, the UNAM campus (Universidad Nacional Autónoma de México) is renowned for its famous work created by some of Mexico’s most well-known artists. Posted June 26, 2013 by AmeriSpan Staff & filed under AmeriSpan Blogs, Uncategorized. ACTFL is an acronym that stands for American Council on the Teaching of Foreign Languages. The aim of this organization is to provide a way of testing the ability of foreign language speakers. The language levels are broken down into four sections: Novice, Intermediate, Advanced and Superior. In turn, these four sections are subdivided into three smaller segments: Low, Mid and High. Students are tested on four different areas of study: Reading, Writing, Listening and Speaking. Thus, some students may reach the advanced level in reading and writing while staying at a lower level in listening and speaking. The latest ACTFL Annual Convention took place in Philadelphia, the largest city of Pennsylvania, between the 16th and the 18th November 2012. ACTFL has partnered with numerous foreign language schools in order to be able to offer a selection of study abroad scholarships to its members. For example, the IMAC Spanish Language Programs Scholarship consists of four weeks worth of Spanish language tuition in Guadalajara, Mexico while the Cemanhuac Educational Community Scholarship comprises two weeks worth of Spanish language tuition, housing, meals and one educational field trip. The upcoming ACTFL Annual Convention is taking place between the 22nd and the 24th November 2013 in Orlando, Florida. More than 250 companies will be displaying their most recent products and services for students and teachers of foreign languages. Harvard University graduate, Dr Wagner, will deliver the keynote speech to set the underlying tone of the convention and summarize the core message of the event. In the past, Dr Wagner has worked as a university professor and a high school teacher. Nowadays, he is a highly sought after educational advisor in the United States and beyond. Dr Wagner has written numerous articles and five books. He will be signing copies of his latest published works: “Creating Innovators: The Making of Young People Who Will Change the World” following his keynote speech. Since its 2004 convention in Chicago, Illinois, ACTFL have declared its reason for existing is to provide “vision, leadership and support” for “quality teaching and learning of languages”. Posted May 23, 2013 by AmeriSpan Staff & filed under AmeriSpan Blogs, Meet AmeriSpan, Study Abroad Tips, Travel News & Info. Amerispan co-founders, John Slocum and Dorioara Pinku, started out as a pair of Spanish students in Latin America. During their travels, they realised that the region was full of Spanish language schools offering affordable tuition to people of all ages. Slocum and Pinku found it intriguing that the majority of the students learning Spanish were trained professionals like doctors and lawyers; this led the pair to believe that the USA was seriously lacking in Spanish language schools and they set about trying to change this. What started out as a business plan on a scrap of paper on a beach in Rio Janeiro is now a multi-award winning company that has been “building bridges between cultures” for the last two decades. Presently, Amerispan offers 15 languages in 45 different countries. Amerispan has 25 years worth of experience in helping students to travel to different countries to learn Spanish. Staff members have personally experienced the destinations on offer by Amerispan so they can give first hand advice on what to expect and how to prepare for your trip. Amerispan is in constant contact with the schools and the host families so all parties are kept informed at all times. There is no risk involved in booking a course through Amerispan because you can cancel at any time and get a full refund. You must give three weeks notice if you wish to cancel your course to give Amerispan the opportunity to offer you place to somebody else. b) The number of students in the class must be the same or fewer. c) The amount of Spanish teaching time and the quality of instruction must be comparable. d) The accommodation must be of a similar quality. Amerispan’s principal goal is to serve their customers. The Philadelphia office is open 8 hours a day; 5 days a week so there will almost always be a member of staff available to help you whether it be over the phone or via email. Amerispan understand that there is a lot of information available and they are here to help you sort through it and to make an informed decision. Posted May 10, 2013 by AmeriSpan Staff & filed under Uncategorized.